1. The working fluid can achieve higher temperatures in a concentrator system than a flat-plate system of the same solar energy-collecting surface. This means that a higher thermodynamic efficiency can be achieved. 2. It is possible with a concentrator system to achieve a thermodynamic match between temperature level and task. The task may be to operate thermionic, thermodynamic, or other higher-temperature devices. 3. The thermal efficiency is greater because of the small heat loss area relative to the receiver area. 4. Reflecting surfaces require less material and are structurally simpler than flat-plate collectors. For a concentrating collector, the cost per unit area of the solar-collecting surface is therefore less than that of a flat-plate collector. 5. Owing to the relatively small area of receiver per unit of collected solar energy, selective surface treatment and vacuum insulation to reduce heat losses and improve the collector efficiency are economically viable. 1. Concentrator systems collect little diffuse radiation, depending on the concentration ratio. 2. Some form of tracking system is required to enable the collector to follow the sun. 3. Solar reflecting surfaces may lose their reflectance with time and may require periodic cleaning and refurbishing. Many designs have been considered for concentrating collectors. Concentrators can be reflectors or refractors, can be cylindrical or parabolic, and can be continuous or segmented. Receivers can be convex, flat, cylindrical, or concave and can be covered with glazing or uncovered. Concentration ratios, i.e., the ratio of aperture to absorber areas, can vary over several orders of magnitude, from as low as slightly above unity to high values on the order of 10,000. Increased ratios mean increased temperatures at which energy can be delivered, but consequently, these collectors have increased requirements for precision in optical quality and positioning of the optical system. Because of the apparent movement of the sun across the sky, conventional concentrating collectors must follow the sun's daily motion. The sun's motion can be readily tracked by two methods. The first is the altazimuth method, which requires the tracking device to turn in both altitude and azimuth, i.e., when performed properly, this method enables the concentrator to follow the sun exactly. Paraboloidal solar collectors generally use this system. The second one is one-axis tracking, in which the collector tracks the sun in only one direction, either from east to west or north to south. Parabolic trough collectors generally use this system. These systems require continuous and accurate adjustment to compensate for the changes in the sun's orientation. Relations on how to estimate the angle of incidence of solar radiation and the slope of the collector surface for these tracking modes are given in Chapter 2, Section 2.2.1. FIGURE 3.11 Flat-plate collector with flat reflectors. increase the amount of direct radiation reaching the collector. This is, in fact, a concentrator because the aperture is bigger than the absorber but the system is stationary. A comprehensive analysis of such a system is presented by Garg and Hrishikesan (1998). The model facilitates the prediction of the total energy absorbed by the collector at any hour of the day for any latitude for random tilt angles and azimuth angles of the collector and reflectors. This simple enhancement of flat-plate collectors was initially suggested by Tabor (1966). Flat-plate collectors can be equipped with flat reflectors, either in the way shown in Figure 3.11 or in the saw-toothed arrangement shown in Figure 3.12, which is suitable for multi-row collector installations. In both cases, the simple flat diffuse reflectors can significantly increase the amount of direct radiation reaching the collector. The term diffuse reflector denotes a material that is not a mirror, avoiding the formation of an image of the sun on the absorber, which creates uneven radiation distribution and thermal stresses. Another type of collector, the CPC, already covered under the stationary collectors, is also classified as concentrator. This can be stationary or tracking, depending on the acceptance angle. When tracking is used, this is very rough or intermittent, since the concentration ratio is usually small and radiation can be collected and concentrated by one or more reflections on the parabolic surfaces. As was seen previously, one disadvantage of concentrating collectors is that, except at low concentration ratios, they can use only the direct component of solar radiation, because the diffuse component cannot be concentrated by most types. However, an additional advantage of concentrating collectors is that, in summer, when the sun rises well to the north of the east-west line, the sun follower, with its axis oriented north-south, can begin to accept radiation directly from the sun long before a fixed, south-facing flat-plate collector can receive anything other than diffuse radiation from the portion of the sky that it faces. Thus, in relatively cloudless areas, the concentrating collector may capture more radiation per unit of aperture area than a flat-plate collector. FIGURE 3.13 schematic of a parabolic trough collector. To deliver high temperatures with good efficiency a high-performance solar collector is required. Systems with light structures and low-cost technology for process heat applications up to 400°C could be obtained with parabolic trough collectors (PTCs). PTCs can effectively produce heat at temperatures between 50°C and 400°C. Parabolic trough collectors are made by bending a sheet of reflective material into a parabolic shape. A black metal tube, covered with a glass tube to reduce heat losses, is placed along the focal line of the receiver (see Figure 3.13). When the parabola is pointed toward the sun, parallel rays incident on the reflector are reflected onto the receiver tube. The concentrated radiation reaching the receiver tube heats the fluid that circulates through it, thus transforming the solar radiation into useful heat. It is sufficient to use a single-axis tracking of the sun; therefore, long collector modules are produced. The collector can be oriented in an east-west direction, tracking the sun from north to south, or in a north-south direction, tracking the sun from east to west. The advantages of the former tracking mode is that very little collector adjustment is required during the day and the full aperture always faces the sun at noon but the collector performance during the early and late hours of the day is greatly reduced, due to large incidence angles (cosine loss). North-south oriented troughs have their highest cosine loss at noon and the lowest in the mornings and evenings, when the sun is due east or due west. Photographs of PTC collectors are shown in Figure 3.14. 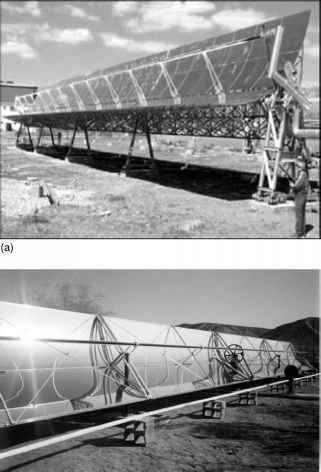 FIGURE 3.14 Photos of actual parabolic trough collectors. (a) The EuroTrough (from www.sbp.de/en/html/projects/detail.html?id=1043). 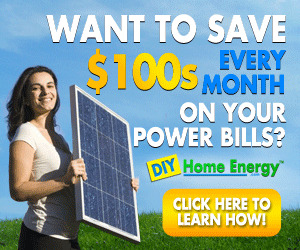 (b) An Industrial solar Technology collector. Over the period of one year, a horizontal north-south trough field usually collects slightly more energy than a horizontal east-west one. However, the north-south field collects a lot of energy in summer and much less in winter (see Chapter 2, Section 2.2.1). The east-west field collects more energy in winter than a north-south field and less in summer, providing a more constant annual output. Therefore, the choice of orientation usually depends on the application and whether more energy is needed during summer or winter. Parabolic trough technology is the most advanced of the solar thermal technologies because of considerable experience with the systems and the development of a small commercial industry to produce and market these systems. Parabolic trough collectors are built in modules that are supported from the ground by simple pedestals at either end. Parabolic trough collectors are the most mature solar technology to generate heat at temperatures up to 400°C for solar thermal electricity generation or process heat applications. The biggest application of this type of system is the southern California power plants known as Solar Electric Generating Systems (SEGS), which have a total installed capacity of 354 MWe (Kearney and Price, 1992). SEGS I is 14 MWe, SEGS II-VII are 30 MWe each, and SEGS VIII and IX are 80 MWe each. Three collector designs have been used in these plants: LS-1 for SEGS I, LS-2 for SEGS II-VII, and LS-3 for part of SEGS VII, VIII, and IX. More details on this system are given in Chapter 10. Another important application of this type of collector is installed at Plataforma Solar de Almeria (PSA) in southern Spain, mainly for experimental purposes. The total installed capacity of the PTCs is equal to 1.2 MW. The receiver of a parabolic trough is linear. Usually, a tube is placed along the focal line to form an external surface receiver (see Figure 3.13). The size of the tube, and therefore the concentration ratio, is determined by the size of the reflected sun image and the manufacturing tolerances of the trough. The surface of the receiver is typically plated with a selective coating that has a high absorptance for solar radiation but a low emittance for thermal radiation loss. A glass cover tube is usually placed around the receiver tube to reduce the convective heat loss from the receiver, thereby further reducing the heat loss coefficient. A disadvantage of the glass cover tube is that the reflected light from the concentrator must pass through the glass to reach the absorber, adding a transmittance loss of about 0.9, when the glass is clean. The glass envelope usually has an antireflective coating to improve transmissivity. One way to further reduce convective heat loss from the receiver tube and thereby increase the performance of the collector, particularly for high-temperature applications, is to evacuate the space between the glass cover tube and the receiver. The total receiver tube length of PTCs is usually from 25 m to 150 m.
New developments in the field of parabolic trough collectors aim at cost reduction and improvements in technology. In one system, the collector can be washed automatically, drastically reducing the maintenance cost. After a period of research and commercial development of the parabolic trough collectors in the 1980s a number of companies entered the field, producing this type of collector for the temperature range between 50°C and 300°C, all of them with one-axis tracking. One such example is the solar collector produced by the Industrial Solar Technology (IST) Corporation. IST erected several process heat installations in the United States that by the end of the last century were up to 2700 m2 of collector aperture area (Kruger et al., 2000). The IST parabolic trough has been thoroughly tested and evaluated at the Sandia National Laboratory (Dudley, 1995) and the German Aerospace Centre (DLR) (Kruger et al., 2000) for efficiency and durability. The characteristics of the IST collector system are shown in Table 3.3. What are the advantages of concentrating collectors over a flat plate collectors? How to use tracking system in parabolic trough collector? Why has concentrating collectors have not been so much developed in tropical climate? Why orientation is needed in concentrating type collectors? How concentrating collectors are classified? What are the advantages of concentrating collector over flat rate type collectors? Why orientation is needed in concentrated type.collectors? Why is orientation needed in concentrating type collector? Why is oreientation needed in concentrating type collectors? Why orientation is needed in concentrating type collectors answre? 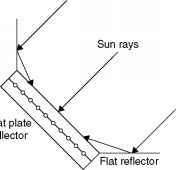 Why orientation is needed in concentrating type solar collectors? Why orientation is required in concentrated collectors? Why orientation is more important in concentrating collectors? 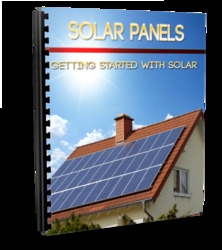 Why orientation is needed in concemtrating type solar collector?